So, we’re back off hiatus. The break was due to a number of things mounting up – not least of which was the launch of my own epic fantasy novel (available now in paperback and e-formats, I’ll have you know), appearances at conventions around that, and dealing with a few other non-Who issues besides. On a more related note, my stubborn and frankly quixotically stupid desire to run this review blog in as strict a chronological order as possible hit a serious brick wall at the crossover point between the Sixth and Seventh Doctors. 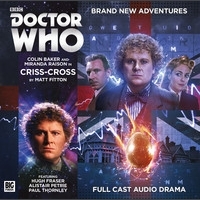 The release schedules meant that pressing ahead would have seen reviews jumping back and forth between the Sixth and Seventh Doctors; rather than do that, I decided to wait until all the Sixth Doctor releases featuring new companion Constance Clarke were made available, piling up Seventh Doctor reviews in the meantime. On the plus side, this does mean I have more than a few lined up and ready to go.